Go Green Systems Ltd are an MCS accredited, Shropshire Business Awards and Which? 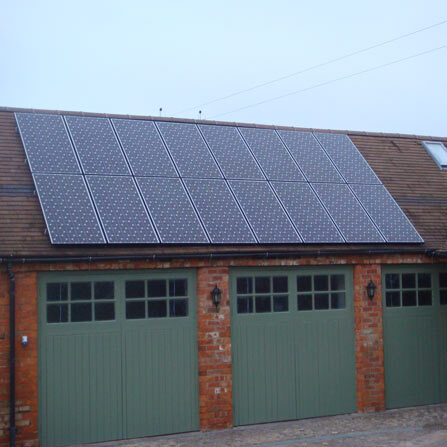 Local award winning solar PV installation company based in Shrewsbury, Shropshire. Offering commercial and domestic installations, repair and maintenance of solar panels and other energy-saving products throughout Telford, West Midlands and Mid Wales. We are expert installers of providing turnkey solutions for the complete installation of renewable energy technologies, and we offer excellent levels of customer service and workmanship making the whole process as unintrusive as possible. Simply give us a call and we can help you to start generating free solar electricity or saving money for your home or business. We would love to hear from you with any questions you may have about venturing into the world of renewable technology (it keeps us on our toes), to book a free technical survey or even if you are after some friendly advice. Please use our contact form and we will reply back to you as soon as is possible. Solar PV panels use the sun's energy to generate electricity. They are easily installed onto your existing roof or on a ground mount system. Information about mounting systems, our awards, and also installation time-lapse videos. The management staff were extremely helpful at all times and the manual workers were exceptionally clean, thorough and a pleasure to be around. Thank you so much. 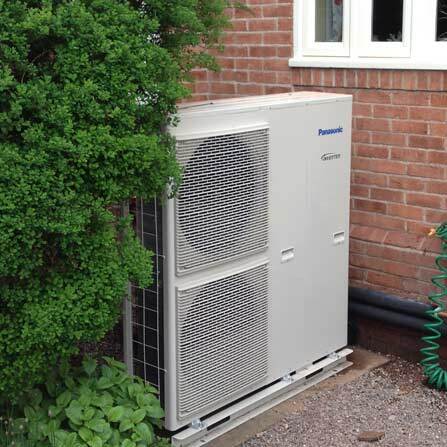 Go Green Systems is a Shrewsbury based company. We have experience in providing an excellent service to all our customers. All our installers are fully trained and qualified to install Photovoltaic solar panels to qualify for the feed-in tariff scheme. We work extremely hard to maintain our impeccable customer satisfaction record. 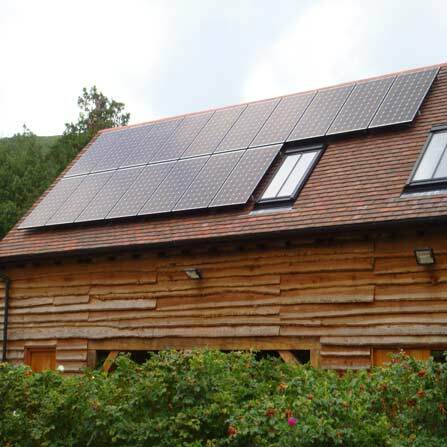 Go Green Systems is a specialist installer of solar PV panels in the UK. Solar photovoltaic (PV) technology converts daylight directly into electricity which can then power your business, home, farm or outbuildings. Solar panels are ideal for urban and rural locations, simply requiring roof or ground area facing between east and west, through south. They are easily connected to the building’s electricity supply so that you can use the electricity and any excess can be fed back into the national grid to generate an income for you. 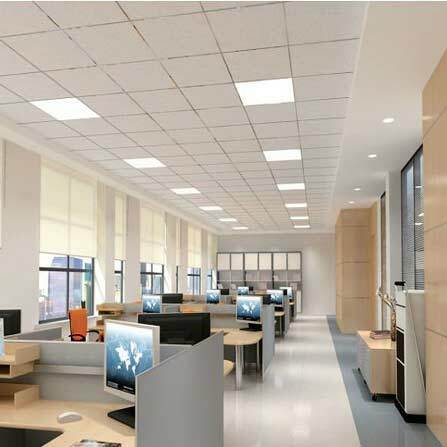 Go Green Systems can design, supply, and also advise you about the types of LED lamps and styles of fittings that will work best for your home, office, resturant/pub or any other buildings fitted with lighting systems. Heat collected from the outside air is absorbed at a low temperature into a special fluid. The fluid then passes through a heat pump compressor and its temperature is increased. This then transfers its higher temperature heat to the heating and hot water systems of your home. Thermal hot water systems have been around for many years, and there are now different types of systems available depending on the needs of your home or business. 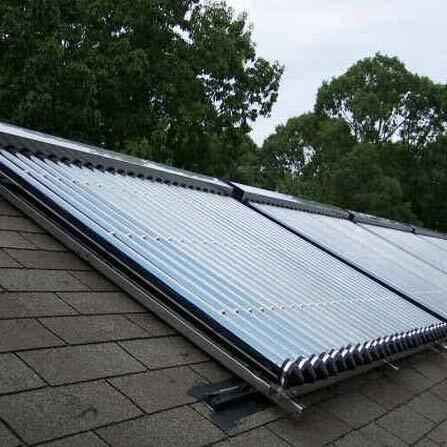 Using the suns energy, collectors usually on the roof, heat up the thermal fluid before passing this on to the hot water system. Are you planning a renovation, building project or a full development site and starting to think about the best types of renewable energy technology to use? A south facing roof is not necessary. Even if your roof faces due east or west, solar panels are still a worthwhile investment. Solar PV panels on a typical UK roof, at a slope of 30 degrees, and facing due east or west will still generate over 80% of the electrical energy compared with one facing due south. For panels facing south-east or south-west the figure is over 94%. How does shading affect solar PV panels? Shading from chimneys, aerials and trees etc is a potentially a big problem when trying to achieve maximum efficiency, so it's important to try to minimise shading wherever possible. Optimised panels and inverters are available where shading is unavoidable, this maximises the systems output and prevents a string's performance from being "pulled down" by one or more shaded panels. Our engineers will be happy to advise you on the best site for your panels. For more information see our Technical Information page and read the section on shading. Panasonic's HIT solar modules (Heterojunction with Intrinsic Thin layer) have been distributed worldwide since 1997. The HIT solar cell is a monocrystalline solar cell which is encased by an incredibly thin amorphous silicone layer. 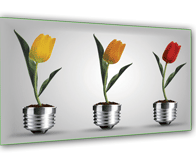 Panasonic's HIT panels offer the highest efficiency ratings in the market. This means their panels comparatively produce more power per square foot/metre than many other manufacturers products, and is great news for those who have limited roof space and want to generate the maximum amount of power they can. Panasonic's HIT panels are also the best at combating high temperatures . All solar panel's output decreases as surface temperature increases. Panasonic have worked hard to reduce this effect on the HIT panels offering up to 10% more power per watt than the majority of other manufacturers. They have now been proven to only lose 8% of their total output due to degradation over the 25 years and have the worlds highest conversion efficiency. How important is the mounting system and installation? When obtaining quotations, it is important that consumers question installation companies about their proposed mounting system. In our opinion, correct mounting is the most important aspect of any installation; the roof structure must not be compromised and the panels must be mounted in accordance with manufactures instructions. Will you send a sales agent out to quote me for free? We DO NOT believe that using a "direct style" sales agent is the correct way to conduct a site survey. Typically they will not carry out a full survey of the property, roof structure or even go up a ladder to take accurate shading information. Their only concern seems to be getting the sale and the commission that follows. Go Green Systems DO NOT employ any sales agents, nor do we pay our surveyors commission. We will undertake a full survey looking at every aspect of the installation, take digital shading analysis, answer any questions you may have, show you information on the correct way to install your system, and then return to our office to compile your quotation before we either email or post it to you. This way you can be sure that the output predictions and investment return figures are correct, and more importantly you get to make the decision in your own time without feeling pressured in any way. Do all the major components have to be MCS accredited? The panels and mounting system must be MCS accredited, consumers sometimes forget the importance of the mounting system! Panels must be accredited for consumers to be eligible for the FIT, thankfully all installation companies adhere to this. However, if a fault was to occur and the mounting used is not MCS accredited; the panel manufactures' guarantee would be invalidated. Inverters do not need to be MCS accredited but they must comply with the standard G83/2 or G59/3. Generation meters must conform to IEC62053. 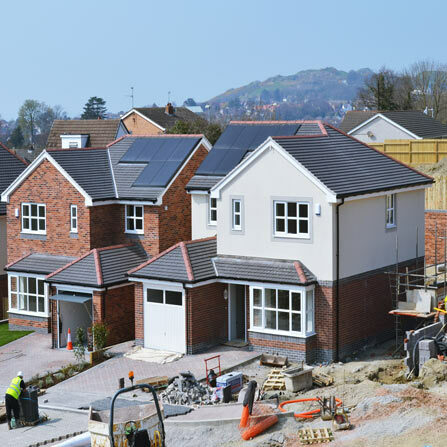 In many cases fixing solar panels to the roof of a single dwelling house is likely to be considered 'permitted development' under planning law, so there is no need to apply for planning permission. If your building is listed you are likely to require listed building consent. This is becoming easier to obtain due to new government guidelines, particularly if the roof is not visible from the road. If your property is in a conservation area, an Area of Outstanding Natural Beauty or in a World Heritage Site, planning consent is required when panels are to be fitted on the principal or side elevation walls and they are visible from the road. If panels are to be fitted to a building in your garden or grounds they should not be visible from the road. If you do need permission of any kind, we will be happy to help guide you through the process. Can I install solar panels on a flat roof? Yes! However, all panels must be properly secured and mounted. There are a number of mounting systems for flat roofs, as you can rarely provide a positive fixing into the roof structure; these systems usually utilise ballast weights. In some cases this can prove to be an issue when trying to satisfy structural calculations. You can even mount panels vertically; so long as they are facing south, you will still achieve over 84% efficiency. Although lying flat you may need to clean the panels quite regularly as the rain run-off will be less. Hope Medical Centre gets Solar PV array to help reduce energy usage.